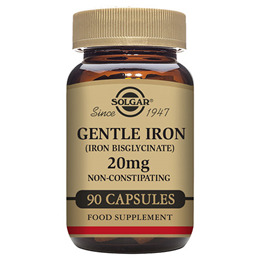 Solgar Gentle Iron 20mg is ideal for those who find traditional iron supplements difficult to take and/or may cause bloating, constipation and digestive issues. 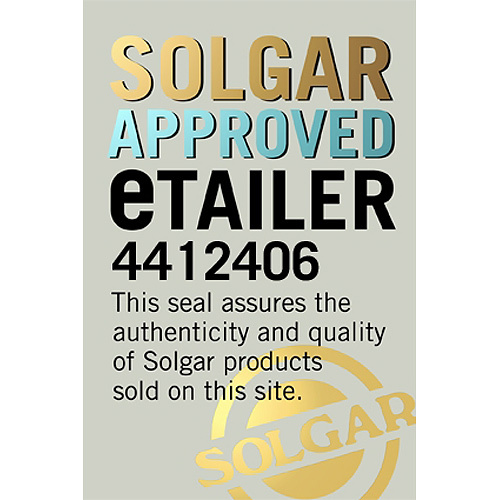 Solgar’s formula contains iron bisglycinate, a form of iron which is tolerated well by sensitive stomachs. Iron is a key mineral and essential nutrient, required by the body for many different biological functions. We should be able to achieve healthy levels of iron by consuming a normal healthy diet consisting of foods such as red meat, pulses, nuts, eggs, grains and leafy vegetables. However, there are times, particularly with those on restricted diets, such as vegetarians, when we may need some additional support. Getting enough iron has been shown to reduce tiredness and fatigue and support healthy energy levels, something many are seeking due to modern lifestyles and natural aging. Iron also helps carry oxygen around the body to our active cells and tissues. In this way, iron contributes to normal cognitive function, normal energy-levels and supports a healthy immune system. 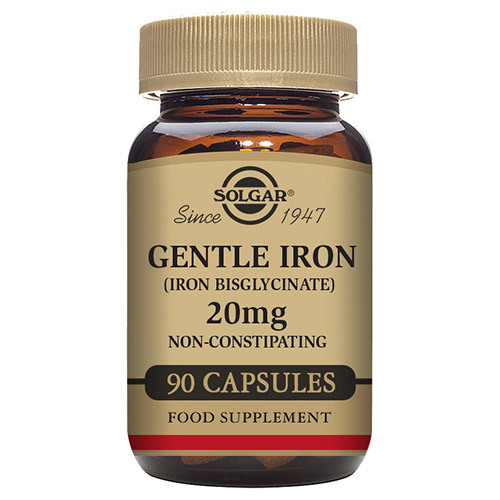 Unfortunately, iron can be quite harsh on the intestinal system so Solgar® introduced Solgar® Gentle Iron, which contains iron in bisglycinate form. This form is easy to absorb and gentle on the stomach. Also contains: Bulking Agent: Microcrystalline Cellulose, Anti-Caking Agents: Magnesium Stearate**, Vegetable capsule Shell (hypromellose). A food supplement for adults, take 1 vegicap daily at mealtime, or as directed by a healthcare practitioner. Do not exceed directions for use. 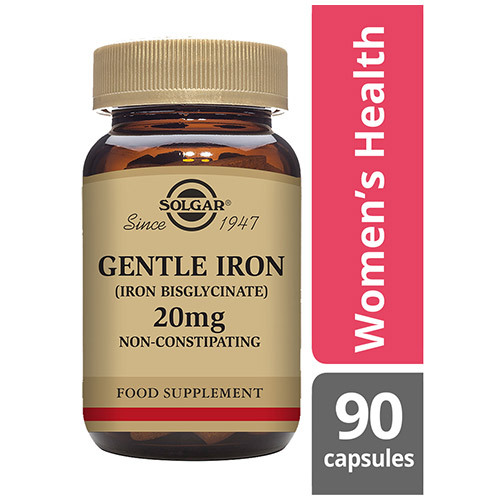 Below are reviews of Solgar Gentle Iron - Bisglycinate - 90 x 20mg Vegicaps by bodykind customers. If you have tried this product we'd love to hear what you think so please leave a review. Good quality products. I know it's absorbed because of blood tests relating to anaemia. Great to be able to up my iron levels without constipation.. an easy to take..
Easy to swallow and no problems with constipation. 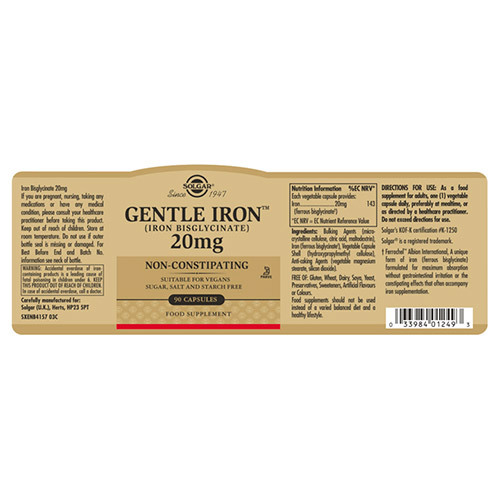 I have only just started taking Gentle Iron which is ideal for me as I cannot take supplements with carbohydrate or sugar bases. My iron was borderline anaemia, so the Dr recommended iron supplementation. There was nothing available on the high street that was veggie, but I'm so glad I found these! They really were gentle on my stomach - I took them according to the instructions and had no problems with stomach upset, constipation or interestingly coloured poo. Best of all, despite being a lower dose than the iron tablets I could get over the counter that weren't veggie, my iron levels had returned to normal after three months. Highly recommended!